Another day, another cloudy name for Windows arrives, this time it’s all about Strata, apparently. 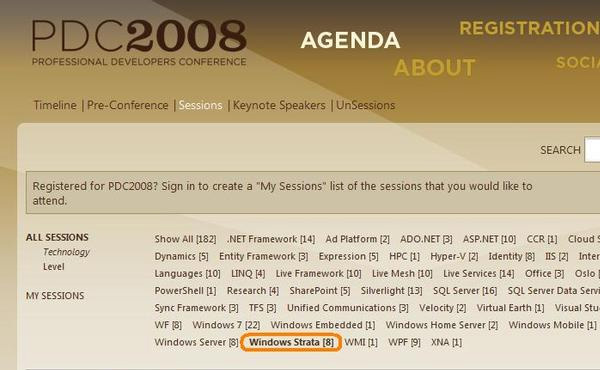 Microsoft temporarily flashed the name Windows Strata on its Professional Developers Conference (PDC) website, before removing the moniker yesterday after a few blogs zeroed in on it. MS head honcho Steve Ballmer told Europeans last week that the firm would soon release a cloud-based operating system to compete with a certain internet kingpin, as it attempts to remain relevant in an online world. “We need a new operating system designed for the cloud and we will introduce one in about four weeks, we’ll even have a name to give you by then. But let’s just call it for the purposes of today ‘Windows Cloud’,” said Big Steve on 1 October. It’s not clear at this stage if Windows Strata is simply an internal codename or in fact the name for the cloudy platform itself. But the fact that it appeared on the PDC website, albeit temporarily, seems to strongly suggest that it is indeed the moniker for Redmond’s latest operating system. Of course, this being Microsoft, many will undoubtedly surmise that the company is whipping up interest in the blogosphere by letting the name slip early ahead of its PDC event, which kicks off on 27 October in Los Angeles.